Yes, congratulations on your decision to form your Holodynamic Holon. A Holon is the first level of organization in the Holodynamics Society. It consists of 6 or more individuals who meet together weekly to study Holodynamic principles, apply the processes, and expand their holodynamic influence into the community and across the world. This is the start of an enlightening and empowering journey for you and your colleagues. Review the attached materials so that you feel comfortable with the Holon structure, commitments, positions and meeting agendas. Identify the 6 founding members of your Holon (including yourself). Review and discuss together the Commitments of a Holon Member. Discuss possible individual goals and group objectives for your Holon (to be finalized at your First Meeting). Review together the positions of Holon members. (see "Positions of Holon members" below). Each member makes an initial choice of which position he or she would like to fill, which will be finalized at your First Meeting. Elect by majority vote a temporary "Holon Leader" who will act in that capacity until the official election at the First Meeting. (See "Responsibilities of Holon Leader"). Identify the time and place of your First Meeting (which can immediately follow this meeting). Choose your initial Holon name, symbol and slogan (to be finalized at your First Meeting). Review the "First Meeting Agenda" and make assignments for that meeting. Fill out the Holon Registration Form (a download version is available online at the Holodynamics Site: www.holodynamics.com). Adjourn until your First Meeting! Keep in contact with each other in case anyone has questions or suggestions before the First Meeting. To provide each member of the Holon empowering support for the unfolding of their full potential utilizing Holodynamic principles and processes, and to act as a synergistic whole to potentialize the community and the world at large. The word "holon" is a combination of the Greek word "holos," meaning whole, and the suffix "on" meaning part or particle. It describes a basic unit of organization in a biological or social system - such as a single cell in an animal, or a family unit in a society. Each Holon has a unique identity. Yet it is made up of sub-ordinate parts (plasma and nucleus; parents and siblings) while at the same time forming a part of a larger unit of organization (a muscle tissue, or an ethnic community). Holons are self-reliant units that have a degree of independence to handle circumstances and problems on their particular level of existence without asking higher-level holons for assistance. At the same time, holons can receive instruction from and, to a certain extent, be guided by more complex level holons. The self-reliant characteristic ensures that holons are stable, able to survive disturbances. The collaboration with more complex level holons ensures the effective operation of the larger whole. Thus, the strength of holonic organization, or holarchy, is that it enables the construction of very complex systems that are nonetheless efficient in the use of resources, highly resilient to disturbances (both internal and external), and adaptable to changes in the environment in which they exist. These Holon attributes can be observed in the most successful biological and social systems. You are currently forming such a holonic organization - a Holodynamic Holon. Your Holodynamic Holon has its own uniqueness: its own name, its own symbol, it's own meeting place and its own goals. At the same time, since your Holon is the primary level organization in the Holodynamics Society, by forming or joining a Holon, you and your Holon are automatically active members of the Holodynamics Society, joining in its mission to extend Holodynamic principles and processes throughout the world. You participate in your Holon; your Holon (with you in it) participates with other Holodynamic Holons in local and regional meetings and international conferences of the Holodynamics Society. Your Holon initiates or supports local, regional and international projects approved by the Society. Six people can form a Holodynamic Holon anywhere in the world. They usually are friends living in the same geographical area so that they can conveniently hold their weekly meetings. Group study of Holodynamics, including texts and manuals. Activities that unfold and develop each of the six levels of growth - physical, personal, interpersonal, social, principled and universal. Practice of Holodynamic processes like tracking and relive sessions. Sharing of experiences and exploring different dimensions of reality. Extending empathetic and loving support to members and guests. Sponsoring Holodynamic seminars and trainings. Research into and development of new branches of Holodynamics. Group projects extending Holodynamics into the community. Health and wellness projects sponsored by reputable agencies or institutions. Addressing the specific needs of the youth and the elderly. Volunteer support for appropriate community and governmental programs. Economic education, strategic planning, and entrepreneurial projects. Other projects that unfold and develop one or more of the six levels of growth. Specific projects recommended by the Holodynamics Society. Your Holon chooses what opening and closing ceremony is appropriate for your group. The suggestion here is that there be a short ritual at the opening and closing which helps to create stronger group identity and cohesiveness. The Holodynamics Society is the worldwide association of all individuals and organizations associated with Holodynamics. As mentioned above, a Holon is the basic social unit of this Society. Individuals can be members of the society without being part of a Holon but the social action of the Society focuses on Holons and on the individuals within them. Holon members join together to form local Holon groups that conduct monthly meetings and activities. At the next level, Local Groups join in a city or region to form a Holon Council, which sponsors quarterly activities and projects. Councils also support National and International Holodynamic Conventions held yearly in various parts of the world. The Society is part of a larger infrastructure. The International Academy of Holodynamics, Holodynamic Centers and Holodynamic Seminars and training programs are included in this network. The Academy hosts the alliance among all educational entities that teach Holodynamic courses, sponsors and accredits courses, distributes official Holodynamic materials, authorizes Centers and Seminars. It certifies individual and group training. The Academy, Centers and Seminars support the activity of your Holon. You or your Holon, in turn, participate in or sponsor Holodynamics Seminars and Centers. You attend classes and study the course materials produced by the Academy. You can be certified by the Academy in the different levels of Holodynamics training. A group of 2 or more Holons form a Local Holon Group. This Local Group conducts monthly activities. Holon Leaders are automatically members of the Local Holon Group Committee, which is headed by a Chairperson elected yearly by these Leaders and confirmed by a general meeting of local Holon members. Lectures and presentations by local or visiting experts. Local research and development programs. Projects that unfold and develop one or more of the six levels of growth -requiring the involvement of a larger number of people than one Holon. A number of Local Holon Groups in a city or geographic area form a City / Regional Holon Council, which conducts large activities on a quarterly basis where all the local Holon Groups participate. All Local Holon Group Chairpersons in the city or region are automatically members of the Council, which is headed by a Council Chairperson elected every 2 years by these Local Chairpersons and confirmed by a general meeting of City / Regional Holon members. Lectures and presentations by national and international experts. Large regional seminars and trainings. Large regional research and development programs. Projects that unfold and develop one or more of the six levels of growth -requiring the involvement of a substantial number of people. Sponsor main events, or include the Holon presentation, in a main event that occurs within your locality. The Holon Leader attends a Local Group Committee meeting once a month. There the Leaders from the Local Holons plan together the monthly Local Group meeting or activity, as well as other events the Local Group wants to sponsor. Projects and activities of your Holon or Local Holon Group can be scheduled anytime the Holon members agree. Each Holodynamic Seminar is sponsored and run by a "Seminar Coordinator" and a seminar committee. Each seminar has a separate participation fee for those who attend. Any individual or group in the Holodynamics Society can act as Seminar Coordinator and committee to sponsor a seminar. Seminars are taught by a Master Teacher, a Teacher or Presenters (a team) who are certified by the Academy. These Seminars are currently structured into Phase I, Phase II and Phase III with additional courses as announced. The Phase I Seminar presents the basic principles of Holodynamics, the first 8 processes, focusing on physical, personal and interpersonal dynamics, and on the Tracking process. Phase II continues the development of the principles and processes, and focuses on family-cultural dynamics and the Relive/Pre-live process as well a Group Field Shifting. Phase III is designed for those who choose to be certified as an Advocate, Consultant, Facilitator, Presenters, Teachers and Master Teachers. The Academy of Holodynamics sponsors special Masters Courses for those who qualify. All these seminars are listed on the Holodynamics web site when you are ready to sponsor a seminar in your area, contact academy@holodynamics.com for information. The Holodynamic Society Central Office will help you with the name and address of qualified teachers who are ready to aid you and your program. In North America and Europe, the weekly fee for your Holon meeting is $10 per person. Of this amount, $5 remains with your Holon (the Scribe is the treasurer) the other $5 is collected forwarded to the Central Offices of the Holodynamics Society. In other areas of the world, the Holodynamics Society sets the fee that is appropriate for particular cultures and economic conditions. In some cases, no fees are charged. We recommend that your fee schedules be correlated and confirmed by the Central Office prior to your Holon being accepted within the Society. I commit to unfold my fullest possible potential, and to potentialize my life. I commit to faithfully be present at each weekly Holon meeting and at other functions of the Holon, the Holon Group, the Holon Council and the Holodynamics Conventions, whenever possible. I commit to apply Holodynamic processes at the Holon meeting and throughout the week in my personal and social life. I commit to support the Holon Leader and all Holon members in their respective positions, and in unfolding their full potential and the synergistic potential of the Holon. I commit to adhere to the principles, ethics and policies of the Holodynamics Society. The Holodynamic Holon has an official structure consisting of formal positions performing organizational functions. At the same time the Holon has a less formal structure patterned after the Six Levels of Growth. Each Holon member participates in this structure. Everyone gets both a formal and informal job. This way each member has responsibility, yet no one has too much organizational burden to carry. In principle, everyone pulls together. This is essential for individual development, and for the success of entire Holon. The formal positions listed below are recommended for most Holons. These positions may be periodically rotated (approximately every year) or as needed in order to give members experience in different areas of the organization. Of course the members of your Holon can modify these positions or define new positions to fit special characteristics of your Holon. But be careful not to lose the benefits of each of these recommended positions. Someone should be responsible for each formal and informal function in some way. This member focuses on the Physical level of the Holon: energy, strength, health, abundance, and vitality. Formally, this member has two specific responsibilities: 1) the physical location of the Holon, 2) the Holon records. The physical location is important, but should not require inordinate attention. In most cases it can be a member's home. The local library or school may also be suitable. It needs to exhibit the appropriate feeling of abundance. On the walls you place the symbol of your Holon, the Mind Model, the Six Level Chart, a list of Holon goals, collages and pictures of recent events, other charts and art work you find fitting. You can set up a book table with recent Holodynamics books and pamphlets, handouts and process guides. Light refreshments should be arranged for Holon members and guests, paid for from Holon funds. Being Holon Scribe means keeping accurate minutes of Holon weekly activities, group decisions, study notes, and financial accounting records. These minutes and records are kept in a formal minute book and made part of the Holon historical records. They are "physical" evidence of the Holon. They create the official record of Holon activity, which may be referred to later in reports to the Society or to the local media. Minutes from each previous Holon meeting are read aloud by the Scribe at the beginning of the next meeting. This reading an important part of your Holon meeting. It supports the institutional memory of the Holon and stimulates group consciousness. The Coach concentrates on all aspects of the Personal Level: self-discovery, "I am Okay," self-assertion, confidence, and creativity. This applies to the development of your Holon as a whole, and to each individual member of your Holon. Formal activities may include group physical exercises, self-discovery and goal setting exercises, sharing of personal experiences, and group support sessions. Informally, the Personal Development Coach has periodic private meetings with each member to discuss their personal goals and how they are progressing, coaching them in their personal work. Informally, this member focuses on the Interpersonal level of development: rapport, mutual respect, "We are Okay," friendship, and intimacy. This may include facilitating group communication exercises, interpersonal skill strengthening activities, intimacy workshops, and doing relationship counseling and support for couples. Formally, this member has responsibility for maintaining a system of communication between the members. It may be a telephone tree, an email address system, or other means of staying in touch between meetings. This member is concerned with the Social level of development: cooperation, camaraderie, open trust, teamship, and synergy. This includes the activities of the Holon, as well as activities shared with the Local Holon Group, and on the community projects the group chooses. The Group Activities Leader is formally responsible for the organization of these activities -- structuring, delegating and sharing the work between all the members of the Holon. Informally, this member is attuned to group dynamics and group processes, facilitating the unfolding potential of the group. This member concentrates on the Principled level of development: openness, fair-care-share, "owning it," "I am," and integrity. This is a powerful and essential part of unfolding the potential of your Holon. Principles, values, ethics, and integrity apply to each member, as well as to the group dynamic. This member informally takes responsibility for this dynamic and facilitates its mature unfolding. As Group Study Leader, this member is also in a formal position to focus on the principled level, leading the group study of Holodynamics books and materials. The Holon, under the direction of the Group Study Leader, votes on the study topics and allocates the appropriate time for each subject in a monthly schedule of study. This monthly schedule is posted at Holon Meetings and made available to all members and visitors. There are a significant number of these materials and various suggested study outlines on the Holodynamics Site. During the intervening week, Holon members are expected to do individual reading and study, preparing for the Holon meeting. Formally, like the CEO of a small enterprise, the Holon Leader is responsible for the overall success of the Holon, and for the Holodynamic development of the individuals and the group. At a deeper dimension, informally, the Leader is responsible for the Universal level: attuned, loving, empowered, knowing, oneness. Every member of your Holon shares this Universal responsibility. Formally it is divided and delegated to the each member, who performs his or her respective function while keeping the whole dynamic in mind. Keep in mind that the Leader is a leader and has functions that cannot be delegated: overall planning and guidance, organizing and structuring the group, final decision-making and giving of formal recognition to others. Once you have held your first meeting, the whole group discusses and votes to formally fill positions that become vacant. The Leader is responsible to formally conduct and make sure such processes are completed. The Leader also designates new Holon positions and conducts the nomination and voting process for each individual needed to fill each position. Each position must be freely accepted by the member assigned, and be approved by majority vote of active Holon members at a Holon meeting. The Leader must personally perform any positions that no other member wishes to assume until someone accepts the assignment. Inside the Holon, the Leader looks to develop members who can later serve as Holon leaders when the group grows to the point it can multiply and spin off another Holon. Outside the Holon, the Leader meets monthly with other Holon Leaders and serves on the Holon Group Committee, forming and guiding the collective Local Holon Group. The Leader represents and speaks for the Holon to the outside world. Both inside and outside the Holon, Leader remains aware that he or she must be an appropriate example of someone dedicated to Holodynamic principles and processes. You don't need to be an Expert! Just Be it and Do It. As you review these positions and responsibilities of Holon members, remember that you are not expected to be an expert in any of these functions, especially at the beginning. Just decide where you would like to focus, and start there. No one is going to judge or criticize you. Everyone is in the Holon to support one another. The Holon is about developing, growing and unfolding your potential, together. You may be delightfully surprised as you continue the process. Amazing things happen in Holodynamics! When new members join your Holon, it's important that they be recognized and, as quickly as possible, receive a job in the organization. As stated above, this is essential for the success of both the individual and the entire Holon. When new members join, they can first share as an apprentice in a position that is already assigned. When this happens, it's important that a clear division of the responsibilities within a position be made to the apprentice. Members can make suggestions and people can work things out together but then, the Holon Leader should formally announce the division of the position into parts, relieve an existing member of one part of the responsibility, and assign that part directly to the new member. Thus, as soon as possible, the new member has a specific assignment, not just an assistantship to an existing member. The new member understands that if they do not perform their function, it will be lacking. Later, as this new member develops, new positions in addition to those outlined above can be identified by the Leader, approved by majority vote at a Holon meeting, and delegated by the Leader. Yes! By all means! Invite visitors to your Holon. Let them take part in all the activities. Extend and invitation to join. This is how your Holon continues to develop. Thus, the processes and principles of Holodynamics are extended throughout the world. 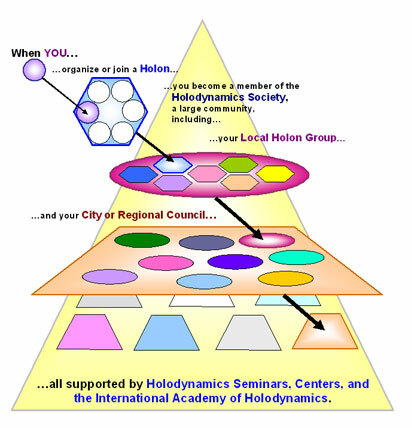 It is suggested that each Holon grows as follows: 1) existing members invite new members; 2) a Holodynamic Seminar is sponsored in the area and new people request or are invited to join your Holon; 3) people respond directly from the Holodynamics Web Site or other source and request to join. No one can join your Holon without the majority approval of the existing active members. Membership is by invitation from the existing Holon members extended to potential members. When your Holon has more than 12 active members, the Majority of members can vote to divide the Holon. (The Holon Leader can vote twice to break a tie.) Then members vote again to choose between Holon A and Holon B, which resulting Holon will they join. It is recommended that each Holon have 6 members or more. The division of a Holon with 12 members is treated as one new Holon and one that is a continuation of the original Holon. Whichever, both Holons follow the same organizational process outlined at the beginning of this pamphlet. The 6 or more members in each Holon now choose a name, leader, goals and positions - all or some of which can be identical to the original Holon. Then they hold their "First Meeting" as a new Holon and each proceeds as two separate Holons. Both are automatically accepted into the Local Holon Group, and each Leader joins the Local Group Committee. TECHNICAL DETAILS: Who qualifies as an "Active" Holon Member, a Holon "quorum," a Leader "pro tem," or a new Leader? An "active" Holon member is any member who attends a Holon meeting or activity (either in person or by electronic means) at least once during the last 30 days unless absence is due to circumstances that cannot permit attendance and notification is given to the scribe. A majority of active members, one of whom is the Holon Leader, can hold a Holon meeting and be a "quorum" for official Holon business. No member can vote as "proxy" for another. However, should the Holon Leader not be able to attend a meeting, the Leader can formally designate a Leader "pro tem," notify the Holon Scribe (who notes this designation in the official minutes), and this Leader "pro tem" acts in the Leader's place with full responsibility until relieved by the Leader.